What would become the Forrestal class began as an outgrowth of the canceled United States and, even though the purpose had changed from pure nuclear strategic strike by a few large aircraft to a more general purpose design capable of performing tactical missions by a much larger air group of smaller aircraft, they were remarkably similar in appearance. In fact early photographs of models and artist conceptions of the two designs are nearly identical and the initial contract configuration closely resembled that of the earlier ship. The main outward difference was an enclosed “hurricane” bow. The design was to be flush decked with a retractable island, four stacks on the port and four on the starboard side designed to minimize the effects of exhaust gases on flight operations, and four deck-edge elevators: one on the starboard side between the retractable bridge and the stacks, two on the port side, and one at the stern. Four catapults were to be installed: two on the bow and one each in waist positions, port and starboard. Armament included pairs of 5″ gun mounts in sponsons at each quarter. As construction of the first ship proceeded, other developments in carrier design, such as the angled deck and steam catapults, were applied while the Forrestal was still on the building ways. The idea of angling the landing area of a carrier flight deck was a simple, but revolutionary one that originated with the British. With the angled deck the traditional way of landing a carrier aircraft, a level approach with power cut to land, could be changed to a power on approach, which allowed pilots to touch down in the arresting gear and immediately apply full power to lift off and go around again if necessary. When the new jet aircraft were introduced after World War II, their jet engines required time to “spool up” to full power. A poor approach often meant hitting the barricades to prevent crashing into aircraft parked forward. During the Korean War the first generation of straight-winged jet aircraft, with their relatively slow approach speeds, could be accommodated with the existing straight deck carriers, but following the Korean War, as the second generation of swept-wing jets entered service, accident rates went up alarmingly. The U.S. Navy first began to give the angled deck serious consideration in 1951. In 1952 the Midway and Wasp were given superficial modifications to test the concept, and the Antietam, an un-modernized Essex-class carrier, was fitted with a true angled deck later that year; the first true angled deck landing was accomplished in 1953. As a result of the experience gained, the decision was made to modify the design of the Forrestal to accommodate the angled deck. The hydraulic catapults used in previous carriers were approaching their design limits, and the U.S. Navy was considering alternative technologies to accommodate the growing weight of carrier aircraft. For the most efficient catapult stroke, nearly constant acceleration is desired and, given the length limits involved, the shorter the braking distance, the longer the power stroke can be. While the Americans worked on powder charge designs, the British worked on steam-powered, slotted-cylinder designs. The first full-scale steam catapult was installed on the HMS Perseus in 1950. A remarkable feature of this design was a water brake, which could bring a 5,000-pound catapult shuttle to a halt in only five feet. The third British innovation leading to the success of the Forrestal design was the mirror landing system. To take advantage of the capabilities offered by the angled deck and the steam catapult, a new method of controlling aircraft as they came on board had to be developed. A landing signal officer (LSO) could only control one aircraft at a time, and the limitations of the human eye made control using paddles limited to no more than a half mile. The British system used a large mirror, concave about its horizontal axis, positioned alongside the landing area at the edge of the angled flight deck. The mirror pointed astern at the angle of the glide path and was mounted on gimbals connected to the ship’s fire control system, which was gyro stabilized. This allowed the mirror to compensate for any motion of the ship. Aft of the mirror a powerful light source was aimed at the mirror so that a cone of light was reflected back along the glide slope. The pilot would see a spot of light, the “ball,” when he flew in the middle of the beam. To position his aircraft more precisely, a horizontal row of datum lights was mounted on either side of the mirror. If the pilot was high on the glide path, the ball would appear above the reference lights, if too low, the ball was below the reference lights. Later, the mirror was replaced by a Fresnel lens and colors added to the ball, but the principle of the Optical Landing System (OLS) was the same. The United States had been designed on the basis of having to operate a 100,000-pound jet that would succeed the AJ-1 Savage as a carrier-borne nuclear bomber. (In 1952 the U.S. detonated its first thermonuclear bomb. Shortly after the Korean armistice in 1953, the Russians also exploded what was thought to be a hydrogen bomb. Later, the earlier atomic weapons were included under the term “nuclear weapons” that came into general use.) As newer nuclear weapons were being developed that were smaller in size, the Bureau of Aeronautics selected the 70,000-pound Douglas A3D Skywarrior (later known as the A-3) as its heavy strike bomber, in 1949. With a smaller aircraft, a smaller carrier was possible. 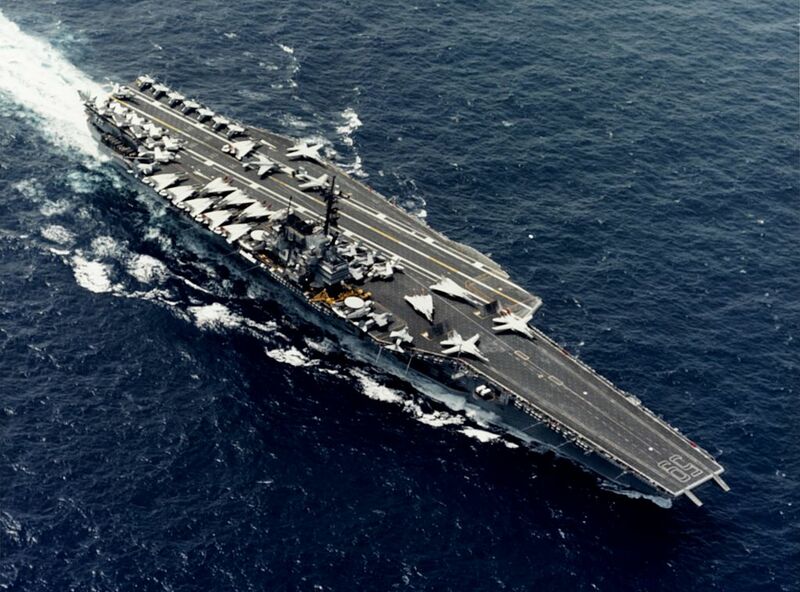 Even before the outbreak of the Korean War, Representative Carl Vinson, long a friend of the Navy, informally indicated that Congress might back a smaller carrier. He suggested a size limit of 60,000 tons and, even though no new plans were prepared, the Bureau of Ships (BuShips) continued studies about what design tradeoffs could be made to bring the carrier design under the 60,000-ton limit. These studies formed the basis of what would become the Forrestal class when approval for new carriers came through. In July 1950, following the outbreak of the Korean War, Defense Secretary Johnson offered the Chief of Naval Operations, Admiral Sherman, a new carrier, and in October, Navy Secretary Matthews approved a revised Fiscal Year 1952 (FY52) shipbuilding budget that included the Forrestal. The Forrestal was initially laid down on 14 July 1952 as CVB-59 (the CVB designation standing for “large aircraft carrier” included the United States as CVB-58 and the Midway-class carriers), and as the Forrestal’s keel was being laid, Congress authorized a second large carrier, the Saratoga. Another large carrier would be funded each year for the next five years. The Saratoga was included in the FY53 shipbuilding program, the Ranger in FY54, and the Independence in FY55. With the revival in support for aircraft carriers came a redesignation to reflect their mission rather than size. The new ship (along with the Midway-class CVBs and the Essex-class CV ships and the mothballed Enterprise) were reclassified as CVA “attack aircraft carriers” on 1 October 1952. From FY52 onward, construction of a new carrier every year was a major Navy goal. The Joint Chiefs of Staff adopted goal for a 12-carrier force for FY52, which was increased to 14 in 1952. Ultimately a peacetime level of 15 carriers was established. As the first carrier laid down after World War II to be completed, Forrestal had a standard displacement of 60,000 tons, 76,600 tons full load. (Displacement is the actual weight of the ship, since a floating body displaces its own weight in water. Full load displacement includes the weight of the ship with all fuel and stores on board.) With an overall length of 1,039 feet, Forrestal was also the largest carrier built up to that time (except for the short lived Japanese Shinano of World War II), and was the first to be specifically designed to accommodate jet aircraft. Compared to a modernized Essex-class carrier, the Forrestal had significantly greater capacities: 70 percent greater ship fuel (2.5 million gallons vs. 1.5 million), 300 percent more aviation fuel (1.3 million gallons vs. 440,000), 154 percent more aviation ordnance (1,650 tons vs. 650) and 15 percent more nuclear weapons storage (150 tons vs. 130). As a result of the Forrestal’s capabilities, there was a remarkable improvement in the effectiveness of air operations, allowing for rapid aircraft turnaround and increased safety. Studies determined that her size and design allowed her to operate 96 percent of the year compared to 60 percent for an Essex-class carrier, and aircraft accident rates were reduced by half. The Forrestal-class carriers were armed with eight Mark 42 5″/54 caliber automatic, dual-purpose (air/surface target) gun mounts, two to a sponson on each quadrant. They were usually controlled remotely from a Mark 68 Gun Fire Control System, or locally from the mount at the One Man Control (OMC) station. (In U.S. naval gun terminology, 5″/54 indicates a gun that fires a projectile five inches in diameter and the barrel is 54 calibers long, i.e., the barrel length is 5″ × 54 = 270″.) The self-loading gun mounts each weighed about 60 tons, including two drums under the mount holding 40 rounds of semi-fixed case type ammunition (the projectile and the charge are separate). The maximum rate of fire was 40 rounds per minute; the maximum range was about 13 nautical miles, and the maximum altitude was about 50,000 feet. As threats from aircraft and missiles grew, these weapons were less effective and were later removed and replaced in most cases by Mark 29 NATO Sea Sparrow missile launchers and Mark 15 20mm Phalanx Close-In Weapons System (CIWS) gun mounts. The forward sponsons also created slamming effects in rough weather that reduced speed because of the spray. Most of the forward 5″ mounts were removed in the 1960s and the sponsons were either removed or redesigned. Previous American carrier design philosophy called for the hangar deck to be the main strength deck and the flight deck to be superstructure above it. In U.S. naval parlance, the hangar deck was the first deck and the decks immediately below it were the second, third, etc. Above the hangar deck were “levels,” the forecastle deck being the “01” level, the gallery deck the “02” level, and the flight deck the “03” level. In both the Essex and Midway classes this resulted in a hangar deck clearance height of 17’6.” The sides of the hangar were kept open for maximum ventilation to allow aircraft to warm up on the hangar deck. In the Essex class, the armor protection was provided mainly by the armored hangar deck; in the Midway class, the flight deck was also protected by armor. In the Forrestal and later classes, the supporting structure of the ship sides went all the way up to the flight deck, which became the main strength deck as well as providing armor protection. The flight deck was now at the “04” level, resulting in a hangar clearance height of 25 feet. Since the sides of the ship hull were part of the load-bearing structure, the large openings in the hull sides for the deck edge elevators had to be carefully designed so as not to weaken the hull. The hangar itself had two sets of sliding bulkheads that could close off the hangar deck into three bays to contain blast and fires. There were two 25-man air crew ready rooms on the gallery deck to allow air crew to scramble to the forward and waist catapults, a 60-man room in the gallery amidships next to the Combat Information Center (CIC) and four large ready rooms (two 60-man and two 45-man) under the hangar deck with escalators to provide access to the gallery deck. The change in design to include a large island superstructure solved many problems posed by the flush deck design with its smoke pipes for stack gases and retractable bridge and electronic masts. The electronic suite on the new island included a large SPS-8 height finder radar atop a pedestal on the wheelhouse and a massive pole mast carrying an SPS-12 air search radar with a Tactical Air Navigation (TACAN) beacon at its top. A second large pole mast carried electronic countermeasures (ECM) antennas. These masts were both hinged so that they could be folded down (the larger center mast folded to port and rested on the flight deck while the smaller mast folded aft) for passage under the Brooklyn Bridge, which was a requirement for major naval ships at the time in order to have access to the New York Navy Yard in Brooklyn. An SPN-8 carrier-controlled approach (CCA) radar was mounted on the aft end of the island. Both the Forrestal and Saratoga were built with two C-7 steam catapults on the bow forward and two C-11 catapults on the port angled deck sponson. The C-7 was a high capacity slotted-cylinder catapult originally designed to use powder charges and was redesigned as a steam catapult based on the success of the British steam catapults. The original version used 600 psi steam because of the limitations of the Forrestal’s propulsion plant. Later versions used 1,200 psi steam. The C-11 was the first U.S. steam catapult and was based on the British BXS-1 system, but with higher steam pressure. When the C-11 catapult that was to be on the starboard sponson in the original flush deck design was moved to the port side of the angled deck, it created a problem in that, for structural reasons, the tracks of the two catapults had to be close together. Operationally, this meant that aircraft could be positioned on the waist catapults at the same time, but could not be launched simultaneously. Later ships of the Forrestal class, the Ranger and Independence, were equipped with four C-7 catapults. The arresting gear on a carrier sets limits on aircraft performance as much as flight deck size and catapult capacity. The Forrestal-class carriers were fitted with Mark 7 systems, which were improvements over the World War II vintage Mark 4 and postwar Mark 5 designs and capable of stopping a 50,000-pound aircraft (up to 60,000 pounds in an emergency) at 105 knots (121 mph).19 When the design was changed from an axial deck to an angled deck this allowed for a reduction in the number of cross deck pendants, which reduced the number of arresting gear engines required, saving both weight and space. Originally there were six pendants, but this was later reduced to four. There are many stages in the life of a warship from an approved design to a commissioned vessel. In the mid-1950s, when the Forrestal and her sisters were built, there were a number of commercial shipyards, as well as Navy Yards, capable of building such major warships as aircraft carriers. Although many components of the ship may have been brought together and assembled beforehand, the laying of the keel is the symbolic formal recognition of the start of a ship’s construction. Launching is the point when the ship enters the water for the first time and, by tradition, the ship is christened with the breaking of a bottle of champagne across the bow as the ship slides down the building ways with a splash. About 12 to 18 months before the ship is to be delivered to the Navy, the pre-commissioning crew (sailors who will eventually crew the ship) are selected and ordered to the ship. The balance of the crew typically arrives shortly before delivery. Sea trials are an intense series of tests to show that the performance of the ship meets the Navy’s requirements and to demonstrate that all of the equipment installed on board is functioning properly. New construction ships will also undergo builder’s trials and acceptance trials prior to delivery, when the official custody of the ship is turned over from the shipyard to the Navy. The commissioning ceremony marks the acceptance of a ship as an operating unit of the Navy, and with the hoisting of the ship’s commissioning pennant, the ship comes alive as the crew ceremonially mans the ship. Thereafter the ship is officially referred to as a United States Ship (USS). The Forrestal was ordered from the Newport News Shipbuilding and Drydock Company in Newport News, Virginia, while the Saratoga was ordered from the New York Naval Shipyard in New York (commonly referred to locally as the Brooklyn Navy Yard). Apart from the 1,200 psi power plants and some other detail changes, the two ships were very similar in appearance. The Ranger and Independence that followed were of the same basic design, but among the most noticeable of the changes were their enclosed sterns compared to the “notched” sterns of the first two ships. The Ranger had forward gun sponsons that were of a different shape than those on the Forrestal and Saratoga and she retained these sponsons when her forward 5″ guns were removed. She had an all welded aluminum elevator on the port side, unlike the steel structures of the other Forrestal-class ships. Also, because the angle of the after end on the flight deck was changed slightly, her overall length increased to 1,046 feet. The Ranger was built at Newport News and the Independence at the New York Navy Yard. In order to expedite her construction, the Ranger was started in a smaller drydock and about four months later her partially completed hull was floated to the larger drydock where the Forrestal had been built. The Independence began construction in one drydock with her stem toward the head of the dock to allow material to be delivered over a truck ramp from the head of the dock to the hangar deck at the stern. The island and sponsons were not installed to avoid interference with a traveling overhead crane. She was also moved to another drydock for final construction. The Forrestal was launched at Newport News on 11 December 1954, sponsored by Josephine Forrestal, the widow of Defense Secretary Forrestal, and was commissioned on 1 October 1955. Just before her commissioning, the construction cost of the Forrestal was estimated to be $218 million. As other ships followed, the growing costs of constructing and operating such large vessels would become the center of debate both within the Navy and the Defense Department. From her home port in Norfolk, the Forrestal spent her first year “working up” in intensive training operations off the Virginia Capes and in the Caribbean, often operating out of Mayport, Florida. As the first of her breed, an important part of this process was training aviators to use her advanced facilities. In November 1956 she left Mayport to operate in the eastern Atlantic during the Suez Crisis, ready to enter the Mediterranean if necessary and returned to Norfolk in December. In January 1957 she sailed for her first of many deployments with the Sixth Fleet in the Mediterranean.